Oh My Heart, have you seen these ears? Hayley Williams has found herself in some Hard Times ending up at Chicago Animal Control to no fault of her own. She was likely dumped by someone and was brought in as a stray. All We Know about Hayley is how adorable and sweet she is. Hayley has a little snort or perhaps damaged vocal chords. Poor girl. We had no problem leashing Hayley up and getting her outside. She relieved herself immediately, we assume she may be house trained. Regardless of her past, Hayley doesn’t hold any Grudges and has Forgiveness as she loves to be close to people and be pet. She jumps up for attention on occasion and would use her mouth to get attention, but not overly mouthy- more of a “hey, pay attention to me” thing. Hayley has an awesome “sit” on command and takes treats gently. Her card says a year, but I’d gather she’s a bit older. You’ll know Hayley is Still Into You when she comes back and tries to jump into your lap for more petting and attention. We had no issues with handling her all over – tail, belly, ears, teeth. No problems bringing Hayley back to her cage, she went back with ease. Hayley is Daydreaming of her forever home. She came in as a stray on 9/6/11 and is available for rescue on 9/9/11 at 7pm. If you’d like to foster or adopt Hayley, please apply with a rescue group today. Information below. Hayley has not formally been introduced to any other dogs or cats. We do not have any information on her dog to dog or cat friendliness at this time. 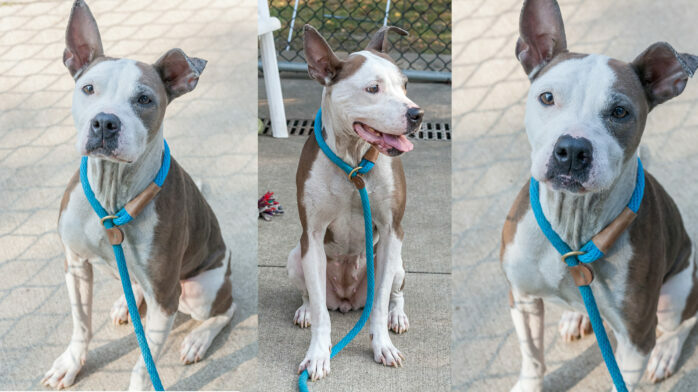 For more information email [email protected] or message the CACC Dog Transfer Team on Facebook.